So, have you tried making Brown Sugar Broiled Grapefruit yet? If so, you might have faced the same dilemma as me, looking down at the remaining juices of the simple dessert, wondering what to do next. If it was only grapefruit, the answer would be simple: Squeeze the remaining juices into a glass, lift to your lips, and enjoy. But since the grapefruit juices are now combined with the lush flavors of brown sugar, drinking the residual syrup somehow just seems so potentially overpoweringly sweet. 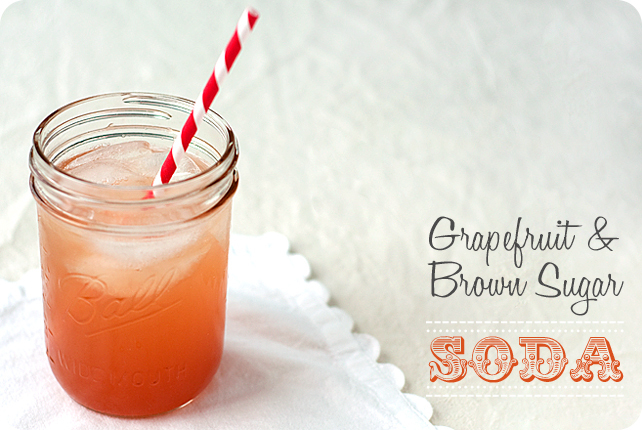 Not to fear - a splash of fizzy seltzer water easily transforms this grapefruit-brown sugar syrup into a refreshing soda! Cute straw optional, but recommended. Squeeze the residual juices into a highball glass, taking care to remove any seeds. Top the glass with seltzer and stir once, very gently. LOVE love this idea! Inspiration to eat more grapefruit during prime citrus season. Totally agree! Hope you love the soda! That was pretty easy! I must try!!! SUPER easy! Just a bright, bubbly drink for the winter! A refreshing drink to start the day. Great photos too! All images and text copyright © 2009-2012 Allison Mannella. Powered by Blogger.